June 29 - Holders Wales set up a mouth-watering quarter-final clash with favourites New Zealand at the International Rugby Board (IRB) World Cup Sevens in Moscow, while neighbours England also face Southern Hemisphere opposition in their quarter-final, as they take on Australia. South Africa take on Fiji and Kenya face France in the other quarter-final matches of the men's tournament, which will be followed by the semi-finals and final which take place at Moscow's Luzhniki Stadium tomorrow. Wales, who won the tournament in Dubai in 2009, booked their place in the knockout phase after hard fought victories over Uruguay, Tonga and Fiji which seen them top Pool E.
The game with the Fijians was a particularly tight affair but tries from Alex Webber, Lee Williams and Gareth Davies helped them squeeze through and set up a clash with the current HSBC Sevens World Series champions New Zealand, who topped Group D following wins over Canada, Georgia and the USA. In Pool A, Australia and France recorded two victories each over Spain and Tunisia, which set up a top of the pool clash in the final game. Despite being outscored by three tries to two, France managed to claim a point against the Australians thanks to the boot of Terry Bouhraoua, who kicked a penalty late on to claim a 17-17 draw. The Australians, however, topped the Pool thanks to a superior try difference. France qualified as the best second-placed team to set up a clash with Pool C winners Kenya, who surprisingly overcame Samoa 17-12 in another top of the pool clash, which sees the Samoans drop down to the Plate competition. Despite victories over Japan and host nation Russia in Pool B, Scotland exited the main competition after being trounced 41-0 by South Africa, with a hat-trick of tries from Cheslin Kolbe. England comfortably topped Pool F from second placed Argentina, following three victories over Portugal, Hong Kong and tries from Mat Turner and Dan Norton, saw them defeat the Argentineans by 14-12 in the their final group game. 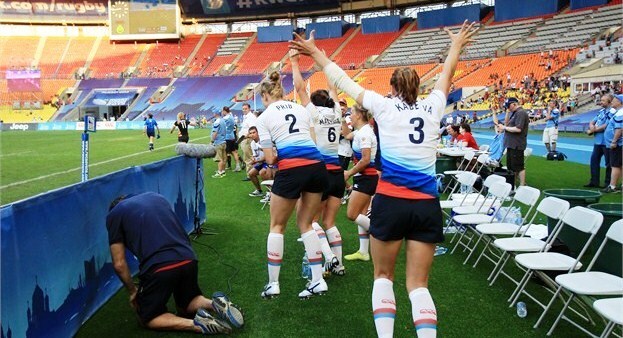 Meanwhile, the women's tournament, which is taking place alongside the men's competition, and hosts Russia caused a shock by beating a highly fancied England side 17-15 to top Pool D.
England had not conceded a single point going into the pool decider, following wins over Japan and France, but tries from Marina Petrova, Ehaterina Kazakova and Baizat Khamidova saw the host nation set up a quarter-final tie with Canada, who finished behind New Zealand in Pool A. New Zealand scored a total of 97 points while only conceding five on their way to victories over Tunisia, the Netherlands and Canada. They take on England in the quarter-finals. Reigning champions Australia almost mirrored the efforts of their Antipodean cousins, as they notched up comfortable victories over China, South Africa and Ireland. Ireland's Alison Miller was the only player to cross the Australian try-line, and following victories over China and South Africa, the Irish secured the runners-up spot, and set up a quarter-final match with Pool C winners the USA. The Americans recorded three wins over Brazil, Fiji and Spain. The Spanish face the daunting task of trying to overcome Australia, after coming second in Pool C.
The women's tournament also concludes with the quarter-finals, semi-finals and final taking place tomrrow, along with the Plate and Bowl competitions in both the men's and women's competitions. 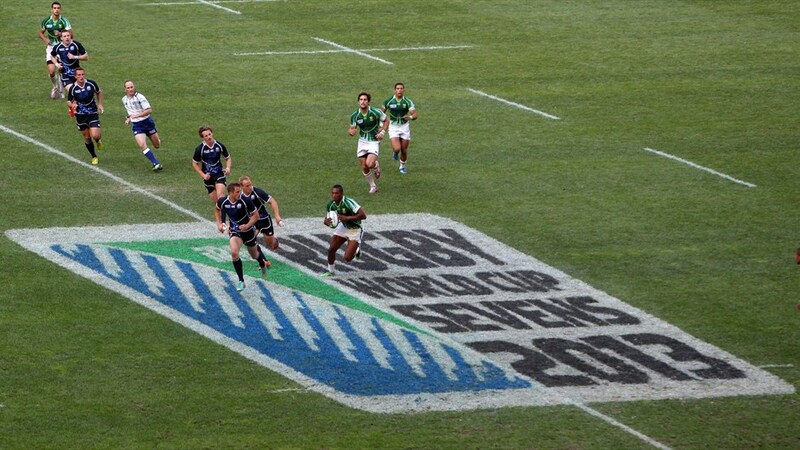 April 2013: Russian Rugby President hopes Moscow World Cup Sevens will "inspire a generation"